Last night, RTÉ's Taragh Loughrey Grant hosted a special live podcast event to mark International Women's Day. 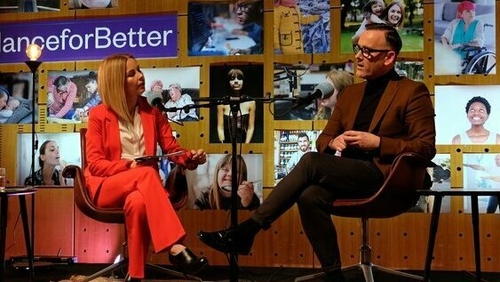 Under the theme of 'Balance for Better', Taragh spoke with RTÉ Director-General Dee Forbes, PWC accountant Deborah Somorin who overcame homelessness at 14, and presenter and fashion designer Brendan Courtney about gender equality, diversity, and much more. You can watch the interviews back over the coming weekend on RTÉ.ie/LifeStyle but you can also listen back to the show on RTÉ Radio 1 on Easter Monday. Additionally, the event will be on RTÉ News Now at 10.30 this Saturday morning - this can be viewed on the RTÉ Player, the News Now app, and Saorview. It was an incredible night filled with music from Sorcha Richardson, a selfie station where guests could strike their best 'IWD pose', wine from Tesco Finest and goody bags filled with treats from the RTÉ Guide, Just Eat, Spotlight, Flahavans, Keoghs, and LaRoche Posay. Plus, each of our panelists received a beautiful bouquet from Flowers Made Easy. If you're interested in finding out more about the Hourglass events, sign up to the RTÉ LifeStyle newsletter!